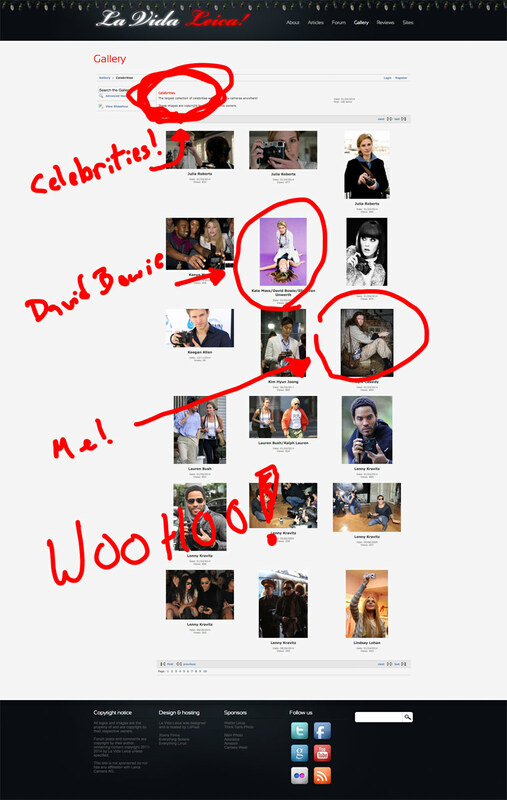 Thanks to John Lee for spotting this, there's a photo of me sandwitched in between David Bowie and Lindsay Lohan on La Vida Leica'a "Celebrities with Leica's" page. Dh00dz. KYLE CASSIDY IS TOTALLY FAMOUS! ALL CAPS! That is some serious A-List shizzle right there, son! And yes, duh, OF COURSE you belong there, you rockstar! Congratulations! High fives! AWW YISSSSS! Also: I thiiiink Lenny Kravitz might have one, too. I'm not sure though. thank you for the never-ending cowbell. i am rocking out. because I have too many tempting wise crack replies from which I think I am succeeding in refraining.